ride sharing, the ELEMENT electrifies every ride as the world's most connected bike computer. 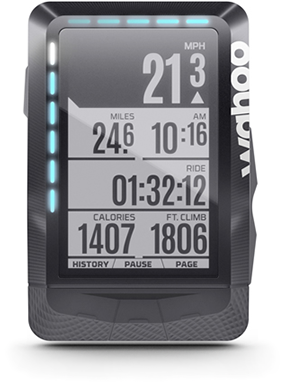 The Wahoo Fitness ELEMNT Companion App is the essential supplement for the ELEMNT GPS Bike Computer that unleashes powerful customization options, detailed performance tracking, and effortless ride sharing. The ELEMNT is the most integrated GPS bike computer on the market with a long list of compatible hardware and smartphone apps. Located on the top left side of the device, this button accesses the Settings menu if pressed quickly while the device is on, or powers it on or off when held for 5 seconds. Use the menu page to easily add sensors at any time by quickly tapping to access the menu, then selecting ADD SENSOR. The bottom buttons are smart buttons that function as described on the screen above each. On the right hand side of the unit are the Info Zoom Buttons which zoom in on your top fields or out to display more data during a workout. They also navigate up and down in the settings menu. The ELEMNT's LEDs offer quick access to important performance metrics like speed, heart rate, and power, as well as turn-by-turn directions. Full instructions for customizing LEDs and sounds is available in the ELEMNT Lights and Sounds Guide. The side LEDs can be set to indicate speed, power or heart rate. The middle LED indicates workout average performance - LEDs above show higher than average performance, while LEDs below show lower than average performance. The top LEDs are used for notifications and let you know which page you're on when switched. Push and hold the left side button on the ELEMNT until it begins warming up to power on. If held once warmed up and running, the same button lets you power off, but a quick tap opens the settings menu where you can add sensors to monitor heart rate, cadence, speed or other metrics. On the ELEMNT's first warmup, a QR code is displayed to make pairing with a smartphone easy through ELEMNT Companion App for iOS or Android. Note: While the ELEMNT battery comes 50% charged, get the best results with a full charge before the first workout. Customize your data, get detailed workout history, and share with friends and family through the ELEMNT Companion App. Features like Live Tracking, Take Me Anywhere, and importing routes are enabled in and fueled through the app. Plan your ride accordingly. After initial pairing, a login page is displayed. Register or sign in to the Wahoo Fitness Cloud, or use your Facebook ID to proceed with the additional setup features below. Note: if login is skipped, additional features such as data backup and sync between devices will be disabled. 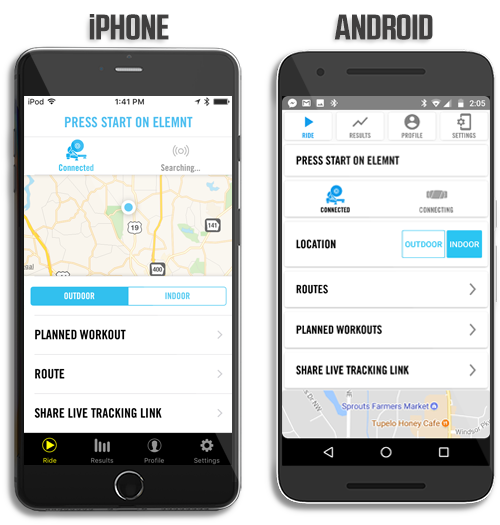 Log in to your favorite fitness sites and the ELEMNT will automatically upload your rides over WiFi. Alternatively, select Next to add these later. Complete a basic profile to be used with the ELEMNT. This information will be used to calculate metrics such as calories and HR zones. Alternatively, select Next to add these later. Enable Live Track to see (and be seen by) nearby riders. Your Live Track links are sharable so friends and family can view your location online. Live Track can also automatically share your location with others when starting a ride. Add recipients via email to continue or skip by selecting Next. You can add additional sensors, or strap the ELEMNT on your handlebars and get cranking now that it's ready for action! If prompted, enable access to the camera. 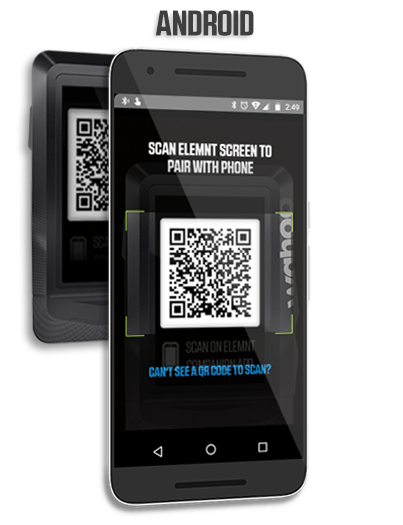 Scan the QR code by simply placing the ELEMNT in front of your camera. 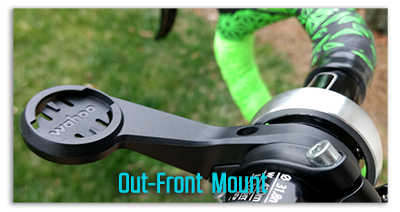 Begin by loosening or removing or the Allen bolt to slide the Out-Front Mount over the handlebars. Position the mount with the Wahoo logo facing upwards and toward the seat. Replace and tighten the bolt until fully secured. Always ensure your mount is secure before a ride. 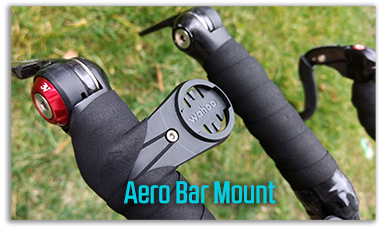 Begin by loosening or removing or the Allen bolt to slide the Aero Mount onto an aero bar. Position the mount with the Wahoo logo facing upwards and toward the seat (or directly away from it, if secured to the right aero bar). 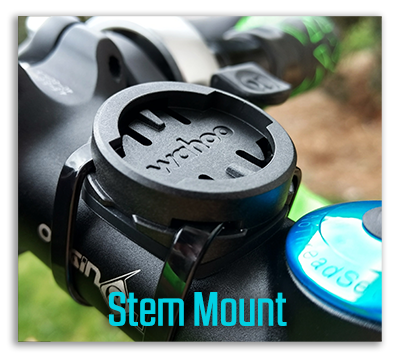 Ensure the rubber mount insert is flush against the plastic stem mount. Thread two zip-ties (included) through the mount's holes and securely tighten to your bike. Once fully secured, trim any excess zip-tie length. Always ensure your mount is secure before a ride. Once your mount is secured to the handlebars, simply place the ELEMNT in the mounting grooves and turn clockwise to lock it in place. To remove, turn counterclockwise and lift. Pairing with the ELEMNT Companion App is essential to setup most ELEMNT features. Continue below to explore each app page, or check out the ELEMNT Feature Guide for instant help with specific features. Quickly add sensors, toggle indoor riding, select a route or planned workout, share your location, or view the ride map. During a workout, your progress is tracked on the map and a live ride summary with additional details expands below. Select a sensor (or Set Up Sensors) for quick access to the sensor page where you can add new sensors, or rename or remove an existing sensor. 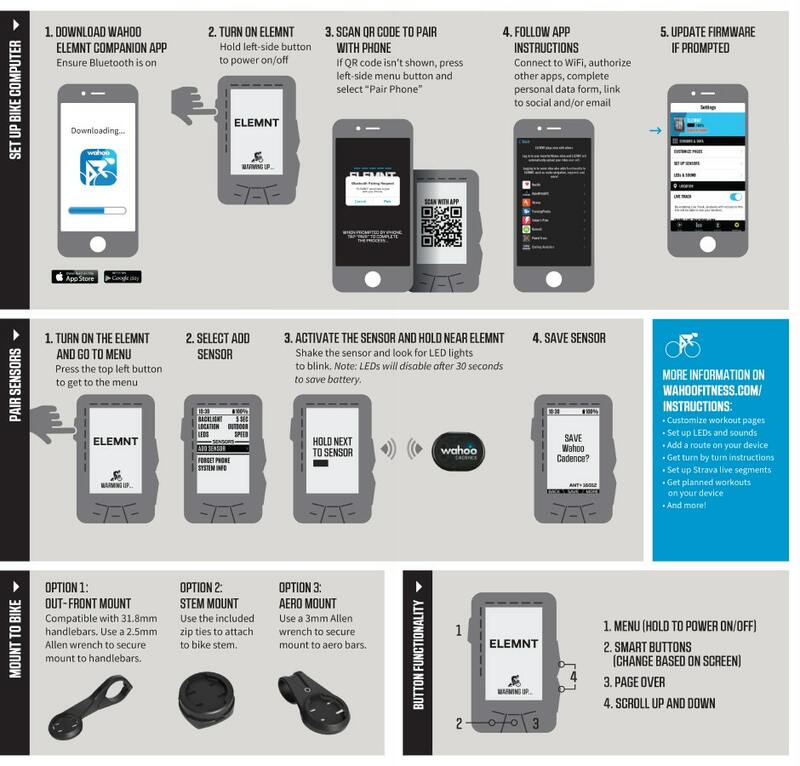 See the ELEMNT Sensor Pairing Guide for more details. Toggle INDOOR mode for use with a smart trainer following the ELEMNT KICKR and SNAP Control Guide. Routes make navigation a breeze. For full details on using routes, see the ELEMNT Routes Guide. Build workouts in advance and get individualized coaching through Training Peaks or Today's Plan. See the Planned Workouts Guide for everything you need to know. Send a link to friends and family to share your location as you ride. Check out the full Live Tracking Guide for specifics. Note: Live Tracking requires a paired phone with an active internet connection and location services enabled. See a summary of completed workouts. Select a workout to display detailed data and statistics. Workouts upload automatically to connected services over WiFi. For details and instructions see Understanding Automatic Uploads. iOS: Swipe left to delete workouts individually, select Edit to delete multiple, or long press and select Edit workout to rename. Android: Long press a workout to access options to Rename, Delete Forever or Delete and Sync Again. Login to your Wahoo account, connect 3rd party services, edit your personal info, or modify power and heart rate zones. 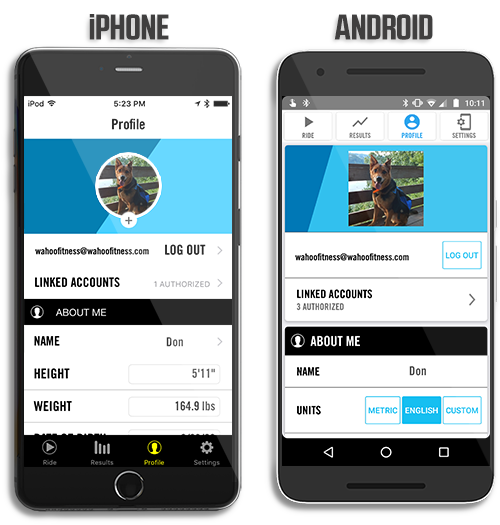 Reconfigure existing workout pages or add up to 3 personalized pages to display on your ELEMNT. Full instructions available in the ELEMNT Customization Guide. Add sensors like one of our TICKR Heart Rate Monitors, RPM Speed and Cadence, or a power meter to collect and display data during your workout. 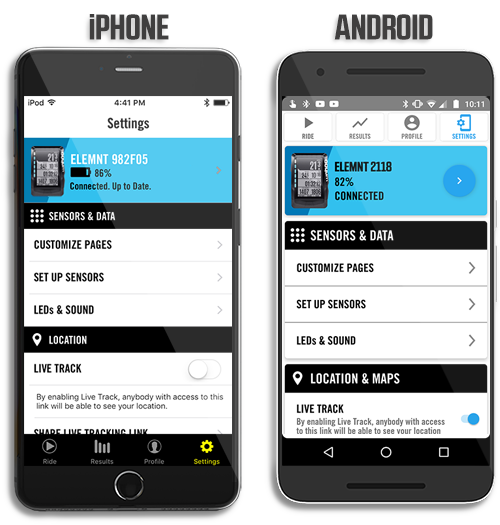 Details on adding and removing sensors are available in the ELEMNT Sensor Pairing Guide. Toggle the LEDs and sound alerts on or off. For more details please see our ELEMNT Lights and Sounds Guide. Turn on Live Tracking to send your location to friends and family while riding. See the Live Track Guide for more info. Add, remove, and update maps on your ELEMNT. For instructions and details see the ELEMNT Maps Guide. Note: Because WiFi is needed to download and update maps, always download maps before traveling for the best experience. When enabled, the ELEMNT's map rotates to keep the top of the display oriented in the direction of travel. If disabled, the top of the map will always face North. Toggle what's displayed during a workout. On by default, Auto Pause prevents workout data being recorded during periods of inactivity. Workouts resume automatically when activity is detected. Disabling records workout data at all times. Off by default, Auto Lap can be set to create a new lap after a given distance or time. Turn the backlight off after a default of 5 seconds, or set always OFF or ON to improve visibility. Backlight timeout is customizable. Off by default, calculations of average cadence and power can be set to exclude periods where received cadence or power is zero. Customize settings while using planned workouts. Setup WiFi directly on your ELEMNT to use automatic uploads, receive firmware updates, update maps, or sync multiple routes. Select a network and enter a password. See Connecting the ELEMNT to WiFi for details, limitations, and troubleshooting. Toggle whether Phone Calls, Messages and Email (iOS only) are displayed on the ELEMNT during a ride when the app is connected. Use Do Not Disturb to disable alerts for set period of time. 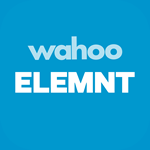 See ELEMNT Alerts and Notifications for details. Enable auto shutdown after a specified period of inactivity to save battery. 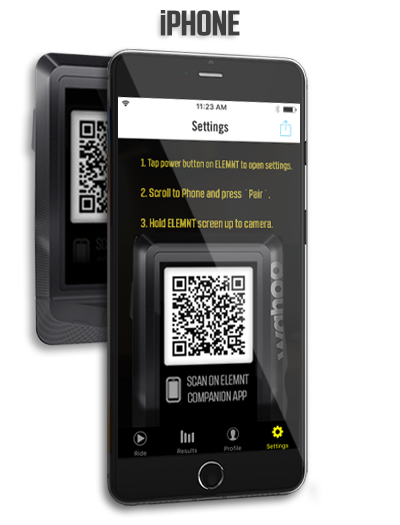 See ELEMNT and Companion App versions, or view legal attributions. Turn on your ELEMNT by holding the left side button. Optional: enable features like Live Tracking and notifications by pairing with the ELEMNT Companion App. Keep your phone on you to continue using these features. Optional: press the PAGE button to display the map where you can select an imported route to use while you ride. Optional: quickly press the left side button to access Settings, then scroll to select INDOOR when pairing with a KICKR or SNAP. Press the START button to begin your workout. Saved nearby sensors will automatically connect when active. 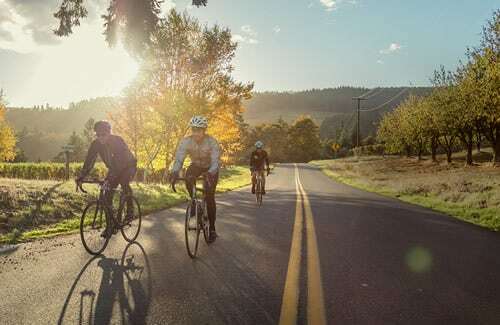 The ELEMNT records temperature, elevation, speed & location, plus data from any additional connected sensors. Press PAUSE to temporarily pause recording of your workout. Press PAGE to change the displayed workout page or see the map. Use the right side buttons to zoom in/out on the data displayed on a page. Use the left side button to see phone notifications when they appear. If pairing with a KICKR or SNAP, a new page becomes available for KICKR control. Press PAUSE to pause the workout, then STOP to end it. Select YES to confirm, NO to keep the ride paused, or DELETE to remove the workout record. 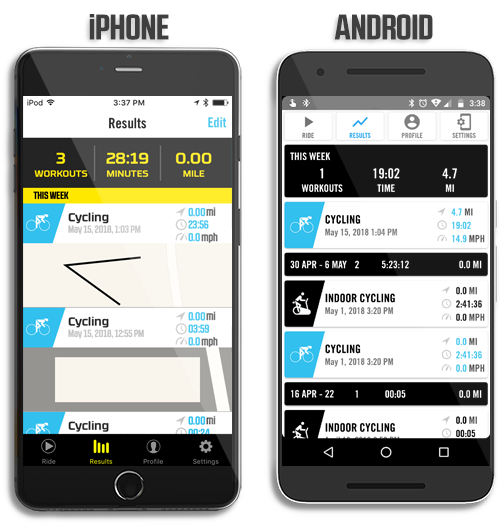 Workout data is immediately available by pressing HIST on the ELEMNT, or connect to the app for additional details. Access the Profile menu in the ELEMNT app to connect and manage your Linked Accounts. Charge the ELEMNT with the micro USB cable provided or a similar cable. The ELEMNT operates for up to 16 hours per charge. Gently remove the silicon dust cap covering the charging port on your ELEMNT. Avoid using Apple brand AC charging adapters - these may fail to provide a full charge. When fully charged, remove the Micro USB cable from the charging port. Replace the silicon dust cap, ensuring a firm seal to keep dust and moisture out. Note: For best results and battery life, always charge to full capacity. Clean and dry the charging port and surrounding area thoroughly if it becomes wet or dirty. Do not plug into a power source until the area is free of moisture or debris. Corrosion or device failure may occur with improper use. When multiple sensors of the same type are connected to the ELEMNT at once, data from the highest quality connection (typically the closest sensor) alone will be used. If one sensor should fail, the ELEMNT will automatically switch to receive data from the next-best connected data source. In other words, it's no problem to pair sensors from multiple bikes to a single ELEMNT since the ELEMNT only uses data from the closest paired sensor for each data type. The ELEMNT measures temperature during your workout, but occasionally may display temperatures that differ from the true temperature of your surroundings. For example, this may occur when the device is placed in direct sunlight, is being charged via an external battery or is subject to sudden changes in temperature. Please see our expansive and easy to use ELEMNT Instant Help Guide for setup help, feature walkthroughs, and advanced troubleshooting, or contact our support team where we're always happy to lend a hand.